The former content performance specialist is turning to security services these days, and the strategy shift is paying big dividends. 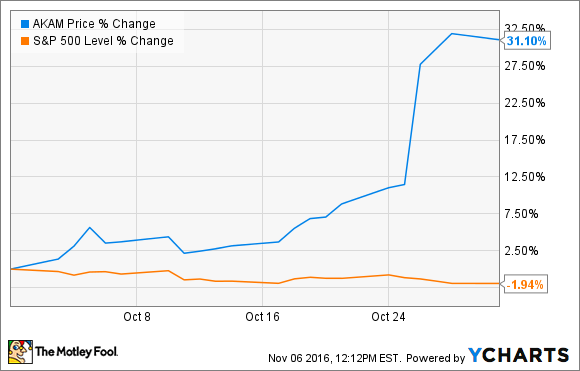 Shares of Akamai Technologies (NASDAQ:AKAM) rose 31.1% in October, according to data from S&P Global Market Intelligence. The stock was already well on its way toward a positive monthlong campaign but jumped another 16% higher on Oct. 26 thanks to a solid third-quarter earnings report. In the third quarter, Akamai's sales rose 6% year over year to $584 million. Earnings landed at $0.68 per share, showing a 10% increase. Analysts would have settled for earnings near $0.61 per share on something like $572 million in quarterly revenue. Akamai's strong quarter rested on newfound traction in the data security market, as the company's content delivery services have turned out to be useful for preventing so-called distributed denial of service (DDoS) attacks. The company's leadership is not shy about pursuing this revenue-generation strategy. "Enterprises need solutions capable of defending against massive botnets that are exploiting millions of online devices," said CEO Tom Leighton in a prepared statement. "This is an area where Akamai's unique architecture and ongoing investments in global scale and security innovation continue to make a critical difference." In a conference call with analysts, Leighton noted that the number of DDoS attacks against the company's clients has more than doubled in 2016, and that the worst is yet to come. In other words, you should expect Akamai to lean even more heavily on the security aspect of its services in future reports.